For the first time in almost a year, Edinburg’s unemployment rate rose above five percent, based on the June 2016 estimate by the Texas Workforce Commission, but that figure still represented the best showing for that month in the city since June 2008, the Edinburg Economic Development Corporation has announced. Edinburg, with a 5.4 percent monthly unemployment rate, along with McAllen (5.1 percent) and Harlingen (5.7 percent), were the only three cities in deep South Texas to post figures for June 2016 under six percent, the Texas Workforce Commission reported on Friday, July 22, 2016. These most recent figures by the Texas Workforce Commission came as University of Texas System leaders were among hundreds of other dignitaries, family and well-wishers who gathered at the UT Rio Grande Valley Performing Arts Complex auditorium in Edinburg to congratulate the inaugural class of 55 students who are beginning their first year of medical school in Edinburg. The Edinburg Mayor, Edinburg City Council, and Board of Directors of the Edinburg Economic Development Corporation played key roles in 2013 in securing a full-fledged medical school from the Texas Legislature for deep South Texas. Rodríguez also is a former member of the Edinburg EDC Board of Directors. Also according to the Texas Workforce Commission, there were 36,322 people employed in Edinburg during the month of June 2016. That performance represents an increase of 612 jobs in Edinburg when comparing the employment figures for June 2016 (36,322) and June 2015 (35,710). The state’s unemployment rate in June 2016 was 4.8 percent, compared with 4.7 percent during the same month in 2015. During this 18-month period (January 2015 through June 2016), when Edinburg did not have the lowest monthly figure, it came in a close second to McAllen. Edinburg’s June 2016 figure of 5.4 percent is part of a consistent pattern of positive reports, including May 2016 (4.5 percent) April 2016 (4.5 percent), March 2016 (4.7 percent), February 2016 (4.5 percent) and January 2016 (4.8 percent), and 2015’s showings – December (4.7 percent), November (4.7 percent), October (4.9 percent), September (5 percent), August (5.4 percent), July (5.7 percent), June (5.5 percent), May (5 percent), April (4.7 percent), March (4.8 percent), February (5 percent), and January (5.2 percent). June 2016: 5.1 percent; May 2016: 4.4 percent; April 2016: 4.5 percent; March 2016: 4.6 percent; February 2015: 4.4 percent; January 2016: 4.7 percent. June 2016: 5.4 percent: May 2016: 4.5 percent; April 2016: 4.5 percent; March 2016: 4.7 percent; February 2016: 4.5 percent; January 2016: 4.8 percent. June 2016: 5.7 percent; May 2016: 5.3 percent; April 2016: 5.2 percent; March 2016: 5.5 percent; February 2016: 5.5 percent; January 2016: 5.6 percent. June 2016: 6.3 percent; May 2016: 5.7 percent; April 2016: 6 percent; March 2016: 6.3 percent; February 2016: 6 percent; January 2016: 6.3 percent. June 2016: 6.7 percent; May 2016: 5.2 percent; April 2016: 5.3 percent; March: 6 percent; February 2016: 6 percent; January 2016: 7.1 percent. June 2016: 7 percent; May 2016: 5.7 percent; April 2016: 5.9 percent; March 2016: 6.3 percent; February 2o16: 6.3 percent; January 2016: 6.8 percent. June: 7.9 percent; May: 6.6 percent; April: 6.7 percent; March: 6.9 percent; February: 6.8 percent; January 2016: 7 percent. All cities combined in Hidalgo County averaged an 8.2 percent unemployment rate in June 2016, compared with 7 percent in May, 7.2 percent in April 2016, 7.6 percent in March 2016, 7.5 percent in February 2016, and 8.1 percent in January 2016. All cities combined in Cameron County averaged a 7.6 percent unemployment rate in June 2016, compared with 6.6 percent in May 2016, 6.7 percent in April 2016, 6.9 percent in March 2016, 6.8 percent in February 2016 and 7.1 percent in January 2016. Also for June 2016, there were 311,923 individuals employed in Hidalgo County, while 157,195 persons were employed in Cameron County during the same month. All cities combined in Starr County averaged a 14 percent unemployment rate in June 2016, compared with 12.4 percent in May 2016, 13.5 percent in April 2016, 14.5 percent in March 2016, 13.9 percent in February 2016, and 14.3 percent in January 2016. All cities combined in Willacy County averaged a 13.9 percent unemployment rate in June 2016, compared with 12.4 percent in May 2016, 12.3 percent in April 2016, 12.6 percent in March 2016, 12.1 percent in February 2016, and 12.6 percent in January 2016. For June 2016, there were 22,594 individuals employed in Starr County, while during the same month, 5,579 persons were employed in Willacy County. The University of Texas Rio Grande Valley School of Medicine celebrated another first on Saturday, July 23, 2016, when it welcomed its first 55 students into the medical profession with the inaugural White Coat Ceremony. Families, School of Medicine faculty, state and local dignitaries and others in attendance cheered as the students entered the Performing Arts Complex auditorium at the Edinburg campus. The Arnold P. Gold Foundation started the White Coat Ceremony in 1993 to welcome new medical students to the health care profession. Today, about 97 percent of medical schools in the United States, as well as schools for other healthcare professions, perform such ceremonies. 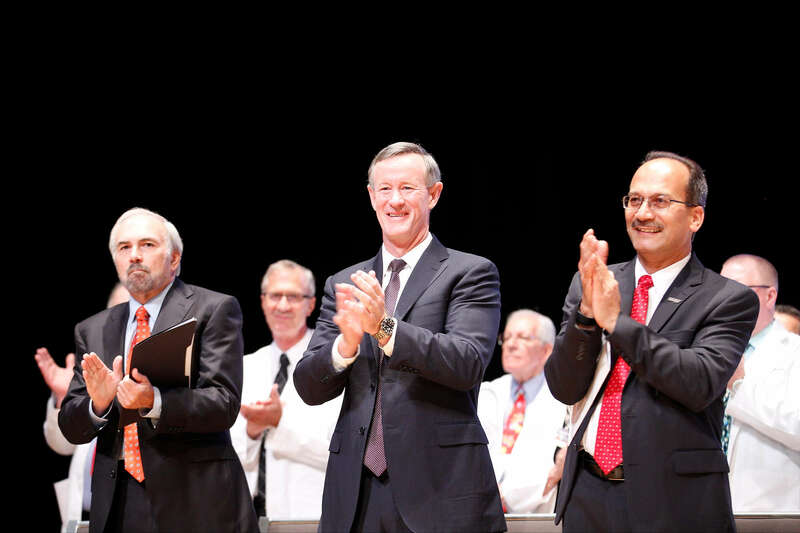 White Coat ceremonies serve as a rite of passage for medical school students. Each student, carrying a white coat, walked across the stage and had Interim Dean Dr. Steven A. Lieberman and Founding Dean Dr. Francisco Fernández helped them don the coat for the first time. After the cloaking, medical student Rouzbeh Kotaki led his fellow medical students in taking the Hippocratic Oath, which acknowledges their primary role as caregivers, in front of their loved ones, school leaders and peers. Throughout the ceremony, students heard encouraging words from UT System Chancellor William H. McRaven, UTRGV President Guy Bailey, UTRGV Provost and Executive Vice President for Academic Affairs Dr. Havidán Rodríguez, as well as Fernández and Lieberman. Dr. Darrell Kirch, President and CEO of the Association of American Medical Colleges, delivered the keynote address, recounting some of his own experiences as a medical student. He stressed that patients should be at the forefront of everything they do, and cited the four key principles of medical ethics – beneficence, do no harm, patient autonomy and social justice. He said this School of Medicine, and they, as students here, have a chance to promote social justice in healthcare by bringing care to people in medically underserved areas. After the ceremony, the medical students said they are honored to be a part of the inaugural class and hope to serve the Rio Grande Valley well. Cristina Cepeda, who grew up in Edinburg and attended Donna ISD schools before graduating with a Bachelor’s degree from UT Pan American in 2014, said her parents instilled in her the importance of earning a college degree. Now that the medical school has come, she said, she has been able to exceed her family’s expectations, earning her medical degree at home and giving back to the community that has supported her. Shawn Izadi, a Coppell, Texas, native and graduate of UT Austin, said he came to UTRGV because he likes being a trendsetter and was taken by the innovative curriculum and caring faculty and staff. There was a private reception following the White Coat Ceremony for students and their families at the Medical Education Building. The reception included a short program during which Texas senators Juan “Chuy” Hinojosa, D-McAllen, and Eddie Lucio Jr. D-Brownsville, presented the School of Medicine with a resolution commemorating the milestone.